The training courses cover haute couture embroidery and decorative technical embroidery. Each consecutive course builds upon the skills acquired in the previous one; however, students can possibly start at higher levels, depending on experience and skill set. Using materials such as silk organza, silk dupion, glass beads, tubes and metallic threads, students are immersed in the world of haute couture Embroidery. Beginners learn on a frame with the “Lunéville hook”, practicing all the basics stitches: chain stitch, rich stitch, vermicelli stitch, and many others. Each training course takes place over 5 days, for a total of 30 hours per course. Students receive a training certificate upon completion of each level. · all supplies necessary for realization of a sample, including the frames, tools, high-end beads, pearls, sequins, threads and fabrics. It is possible to receive your personalized tuition in French, English, Italian, or Spanish. Working on a hoop, students work with various sizes of needles and threads, using cotton and silk fabrics. 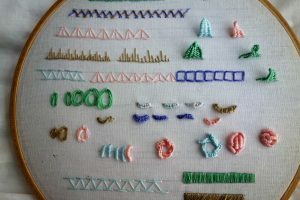 Various foundation stitches are covered in order to build a basic knowledge, common vocabulary, and / or to help seasoned hoop embroiderers sharpen their skills before building upon them. 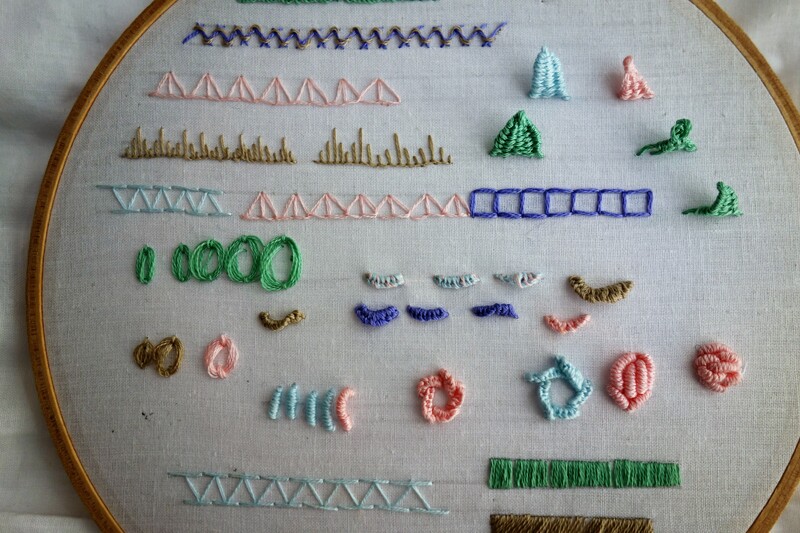 Stem stitch, Daisy stitch, Knotted stitch, Fishbone stitch, French knots, Couching, and Featherstitch are just a few of those covered in this introductory level. 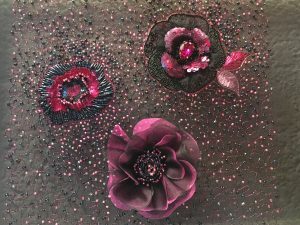 Students will learn how to embroider with silk ribbon, as well as how to effectively embellish works with beads and sequins using needle and thread. This course provides an important base for transitioning to the haute couture skills on the Lunéville hook and frame, as needle techniques will be used in tandem with the Lunéville hook techniques to realize the haute couture samples. Students are introduced to the Lunéville hook and frame, the primary tools of Haute Couture Embroidery. 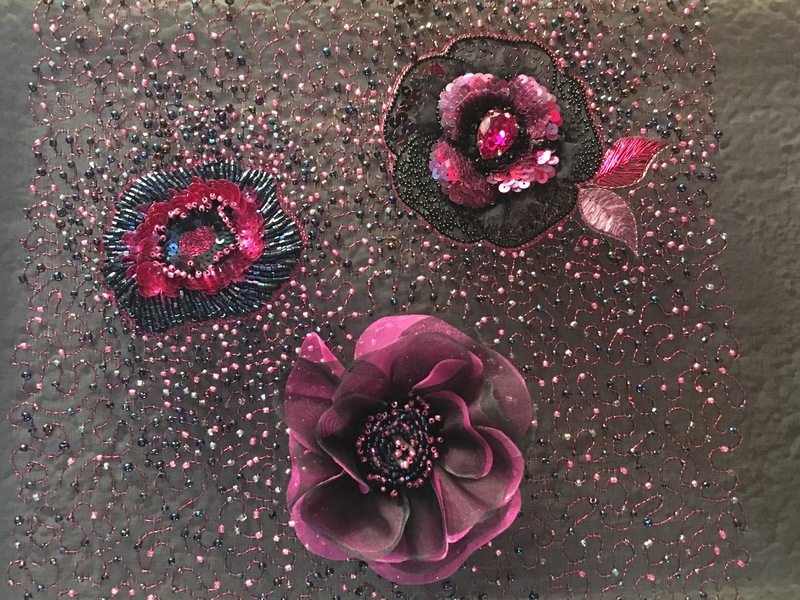 Working on transparent silk organza which they learn to stretch on the frame, students learn how to achieve the chain stitch with the hook, while experimenting with beads, sequins, tubes, felt, and cotton and metallic threads. Building on the techniques of the previous level, students begin working with opaque silk fabric, embroidering with chenille and metallic threads. Beads, sequins, metallic braiding, and cord are used in new ways, strengthening students’ skill level with the Lunéville hook in combination with needlework. Students will learn new stitches and create volumes with new materials such a full grain leather, felt, and DMC threads. Building on the techniques of the previous level, students discover new techniques using material such as silk organza, silk dupioni, beads, tubes and metallic threads. New stitches such as rich stitch, couching, raised sequins, zig-zag tubes and vermicelli stitches are introduced. This level is a review and expansion of all techniques previously covered. Students create volume with special metallic threads, silk embroidery ribbon, raffia, and learn various technical applications. In the 5th and final level, various previous techniques are combined with new techniques to create flowers in volume. Students experiment with various methods for cutting petals. Traditional needle embroidery is mixed with Lunéville hook techniques. My biggest goal is to pass on a wide range of hand embroidery techniques, while allowing students to manipulate stitches, materials, colours and motifs in a personal, creative way. I will consider any specific training request and the experience level of any seasoned embroiderers, as well as choices of material, inspirations and techniques, as relate to individual projects.